Essentially there are two ways of drawing a figure from imagination, the first and in some ways most sensible way is to conceive of the figure as a collection of blocks and cylinders and keeping true to the pre-designated proportions of the average human or the somewhat idealized proportions of the kind of people who regularly sashay around Manga and Superhero comics you then proceed in an orderly direction to construct your drawing. 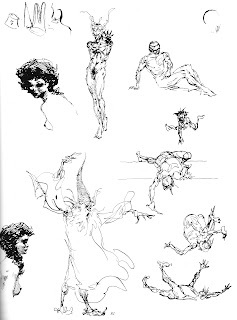 The example here is courtesy of George Bridgman's Life Drawing a book that was recommended to me by none other than Ian Gibson, who was less than impressed with my parlous figure drawing. It is I t hink a little less parlous these days and any success that I have achieved in this direction I attribute to Messrs Gibson and Bridgman. Anyway lets assume that you have at least got a rudimentary feel for anatomy and that you have immersed yourself in some good life drawing books and classes aren't a bad idea either, plus most of us see people on a daily basis in one form or another so carry a sketch book and draw them whenever possible. You're building up knowledge and avoiding the trap of settling into faulty pre-conceptions of figure work. So you've got all this knowledge tucked under your belt, now you start to work up your figures from imagination, with method one which I'll call the considered approach you continue following the constructivist building up of the figure as a series of blocks and cylinders following what you've absorbed from Bridgman. This has the advantage of putting you in the position of having to analyze exactly what it is that the figure is doing before you put pencil to paper - it really forces you to think. But this is also the disadvantage of this approach - it is considered and it doesn't allow for you prodding your subconscious. Method two, which is often referred to as gesture drawing is the polar opposite to the constructivism of method one. 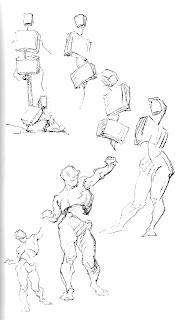 With gesture drawing you absorb the lessons of Bridgeman and then you throw the book away and scribble what you feel the figure might be doing. This is much, much more intuitive but it's also more exciting. It's not unlike being confined to bed with nothing to stare at but a damp patch on some textured wallpaper - after a while you can start to see the most amazing scenes revealing themselves and this is essentially what you're doing with gesture drawing. You are creating the opportunity to stimulate zones of your subconscious and pull forth memories and impressions which drawing in the pre-ordained manner of the constructivist approach doesn't cater for. 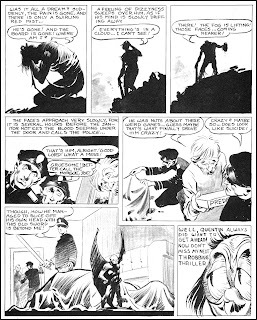 Pre-eminent amongst the school of gesture artists is Frank Frazetta, here's some of his drawings which shows his sense of rhythm and fluidity that suffuses all of his work and a couple of pages from his last comic book story from Creepy No 1. 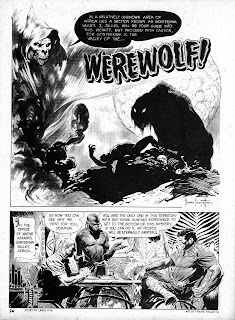 After this story appeared Frazetta devoted himself entirely to his painting producing a simply phenomenal run of covers for Warren, but with this story in contrast to the stories of all the other artists appearing in that issue Frazetta's piece stands out as being uncompromisingly visceral and edgy, everything is crackling with life and dynamism, even if individually some aspects of the drawing aren't as fully resolved as the Reed Crandall or Al Williamson pieces appearing in that same magazine. 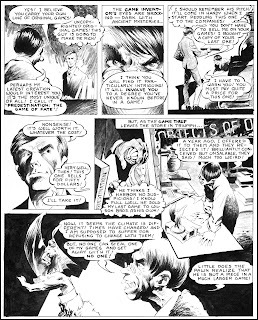 You can see the influence it had on a young Berni Wrightson in the following Web of Horror story, which first appeared in issue one of that magazine when Wrightson was still only twenty but clearly absorbing the lessons of the master. 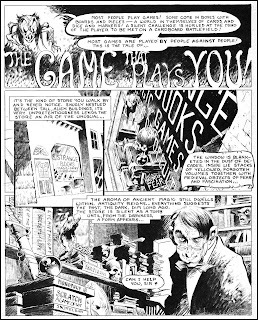 Interesting how this story neatly anticipates the compulsive and addictive tendencies of on-line gamers, which in 1969 would have seemed an incomprehensible concept to most Web of Horror readers. Insofar as I have any artistic ability at all, I definitely follow the gesture drawing method. When I'm writing Mirabilis, I start with scrappy little thumbnails and then, after doing the script, I redraw those for Leo to work from. But often I find that the redrawn figures, where I'm thinking about what I'm doing, lack the sense of movement or expressive posture that I got by instinct to begin with. When it comes to composition and "choice of lens", I often have a vague sense of the way I want a particularly striking image (a full-pager, say) to look, but I can't easily draw it the way it feels in my mind. It's like trying to recapture the sensations you had in a dream. So often I'll rub out and redraw one of those sketches half a dozen times before sending it to Leo. I only know what I was after when I finally manage to draw it! 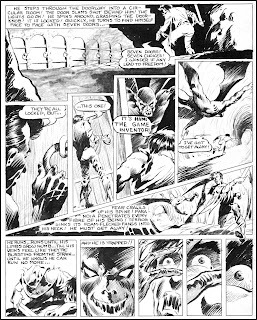 All of which is a very long-winded way of saying that I have nothing but admiration for real artists who can conceive an image and then translate that onto a page without all that trial-and-error fumbling. Well count me in amongst the trial and error fumblers Dave, but what you're creating with Leo and Nikos is well worth the redraws. I'm fascinated by your latest posting on the Miabilis Blog. 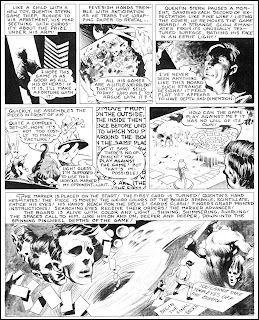 A new age dawns for e-comics and a very immediate example of demonstrating what the future could offer. Yes, definitely, beyond a certain point it's like your drawing ends up on life support and beyond a certain point you just have to switch off the machine and start again and that's when it really gets challenging because at that point you've well and truly lost the initial impetus. 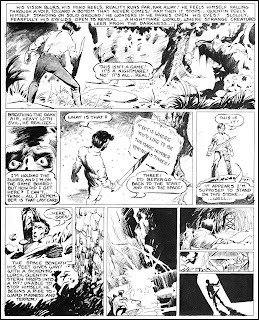 You'll see some of the pages Frazetta created in that overnight workout. And surprise, surprise - it's none other than George Bridgman's Anatomy Book. 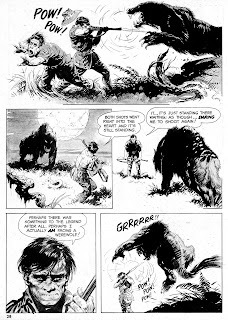 Frazetta was a sublime and very confident draughtsman and while some of his early stuff such as Dan Brand and Tipi is a bit uneven in places, it never lacks chutzpah and I think a little bit of chutzpah along with constant observation and practice goes a long way when it comes to drawing with conviction.